O Jesus, Word made flesh, savior of the world, your life is for us an example of total dedication to your Father and to the work he entrusted to you. Help us to live fully our religious consecration, to spend ourselves completely in your salvific mission to the people of God. Mary, Mother of God, obtain for us the grace of intimate union with your divine Son and in and through him with the Father and the Holy Spirit. 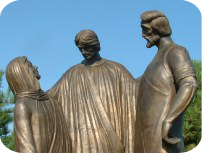 St. Joseph, guardian of the Holy Family, teach us to live a life of prayer, work, and self-forgetfulness, that we may become ever more docile instruments of the will of God. 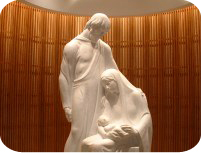 Jesus, Mary, Joseph, inspire us so to live our community life, that we may be a sign to others that Christ has come, that our hope is centered in him, and that we look forward to the glory of the resurrection. 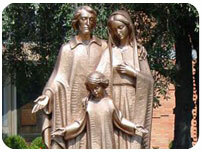 O Holy Family, bless and protect all the families of the world; safeguard their unity, fidelity, integrity and dignity. Enable them to live according to God’s law that they may fulfill their sublime vocation. May their lives be a reflection of yours and may they enjoy your presence forever in heaven. Amen. 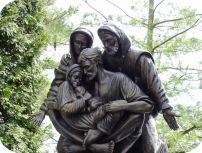 Jesus, Mary and Joseph, teach us the sublime dignity and the vital duty of fostering vocations. Give us one heart and soul. Give us the grace to be ever aware of our tremendous responsibility for setting a good example in our own relations so as to act as a magnet for drawing vocations. We are eternally grateful for your numerous graces in the past, the present, and the future. Help us always to be aware of God’s presence within us. Hidden Child of Nazareth, teach us! Blessed Mother of Jesus, guide us! Faithful guardian of Mary, protect us! 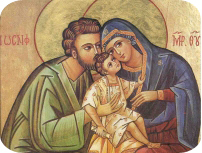 Holy Family of Nazareth, bless our Congregation with numerous vocations to do your work. Amen.